When we think about where our smartphones are made, the majority of us think of China and companies like Foxconn. While the world’s second largest economy is obviously an important link in the global supply chain that feeds our smartphone addiction, South Korea plays just as an important role in making the latest and most advanced mobile devices. It turns out you don’t have to go far from South Korea’s bustling capital to see where one of the country’s two consumer electronics powerhouses makes its phones. Just one hour drive from Seoul — along the Gyeongbu Expressway, South Korea’s second oldest highway — is Pyeongtaek. The city is home to LG Digital Park, one of LG’s largest and most advanced manufacturing complexes. The LG G6 being shipped for its release in North America at the beginning of April. On a clear day, the drive along the Gyeongbu Expressway to Pyeongtaek is picturesque. In the springtime, the highway is lined with blooming cherry blossom trees — known as beojkkoch in Korea. In the distance, soaring corporate towers from LG and Hyundai are framed by nearby green hills and mountains. Even viewed from the window of a speeding car, one thing is clear: when its not obscured by smog, South Korea is a beautiful country. Pyeongtaek’s claim to fame, if you can call it that, is that it’s home to Camp Humphreys, one the U.S. military’s largest overseas bases. I didn’t see the area surrounding the base, but one article on Pyeongtaek succinctly describes the city as “a slice of Americana in the Korean countryside.” With more than 40,000 U.S. military service members in the city at almost any given time, Pyeongtaek is different from other Korean cities. A researcher of LG Electronics conducting a water resistance test of the LG G6. As per the IP68 standard, the LG G6 is still usable after being submerged for 30 minutes in water 1.5 meters deep. Near the base, restaurants offer North American fast food staples like French fries and burgers alongside more traditional Korean offerings like kimchi. What’s more, signs from many of the local business are in English, not the ingenious Hangul script that makes up the Korean alphabet. Most tourists never set foot in Pyeongtaek for the simple reason that there are far more interesting things to see in nearby Seoul and other parts of Korea. In other words, it’s the perfect setting for a manufacturing complex. When LG first pitched me on the idea if visiting Pyeongtaek, I imagined a single factory devoted to making smartphones. However, it’s more accurate to describe LG Digital Park as a sprawling, university-like campus devoted to manufacturing smartphones and automotive tech. More than 10,000 employees call the place their place of work, with some even living in the dorms that are located on the complex’s premises. The first part of my tour involves a visit to a showroom that details LG’s recent history and accomplishments. 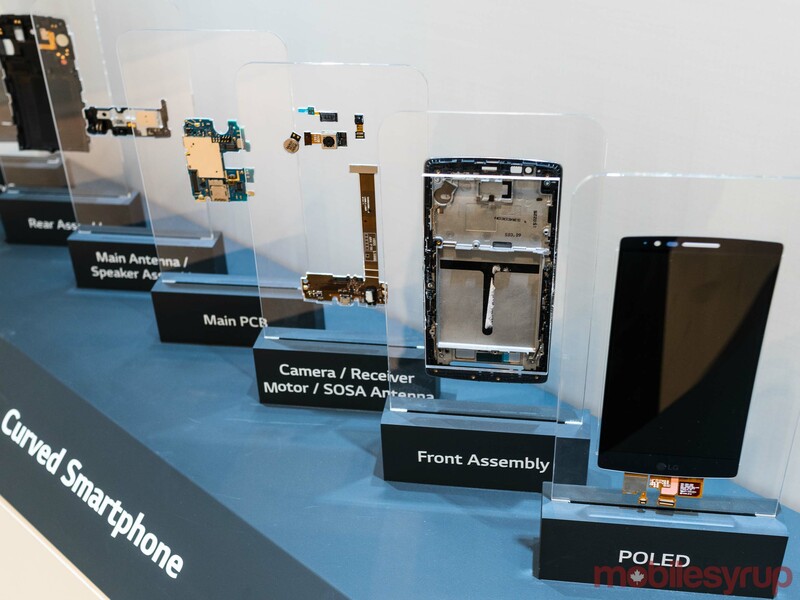 A display showcasing LG Electronics’ work in POLED screens. LG, as most western consumers know the company, was formed in 1958 when two related Korean firms, Rak-Hui (pronounced ‘lucky’) Chemical Industrial Corp. and GoldStar Co. Ltd merged to form Lucky-GoldStar. In 1995, hoping to gain more of a foothold in the West, the company rebranded itself as LG. While most of the showroom is devoted to more recent milestones, like LG’s advancements in OLED TV panels, there are a couple of more historical artifacts as well. The A-501, the first radio LG, then known as GoldStar, manufactured. One of the standouts is the first radio manufactured by GoldStar. At the time GoldStar made its first radio, South Korea, fresh from the upheaval of the Korean War, was one of the poorest nations in the world. 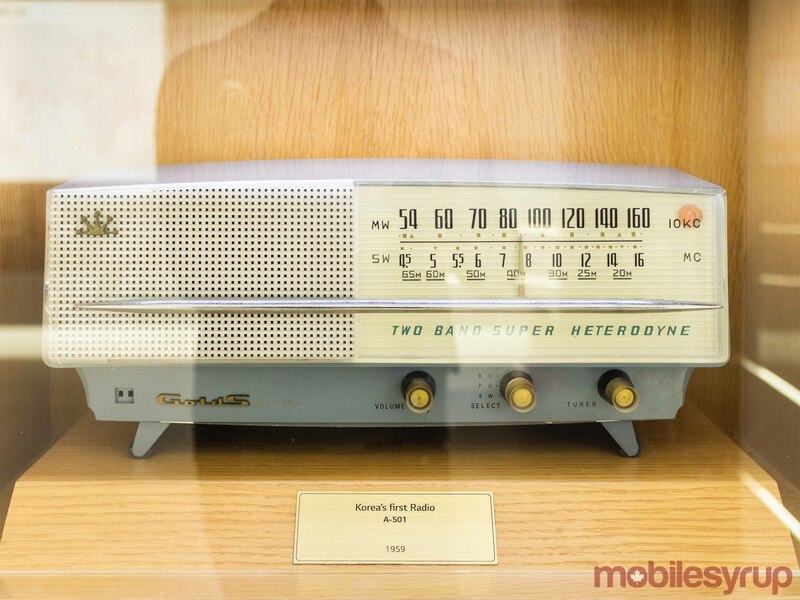 In a turn of events emblematic of Korea’s meteoric climb to the top of the global stage, LG acquired a majority stake in Chicago-based Zenith, the first company to make a mass-produced AC radio, in 1995. In 1999, the company became a wholly owned LG subsidiary. 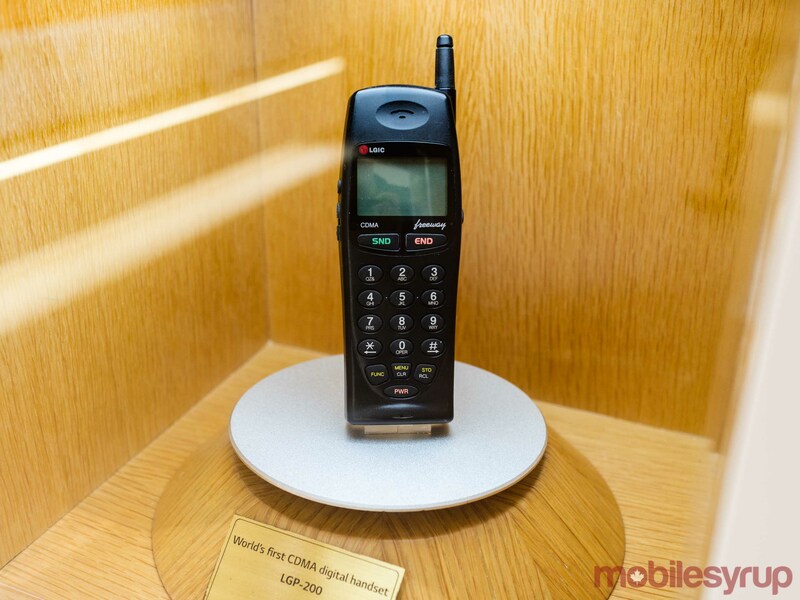 The LGP-200, LG Electronics’ first CDMA handset. 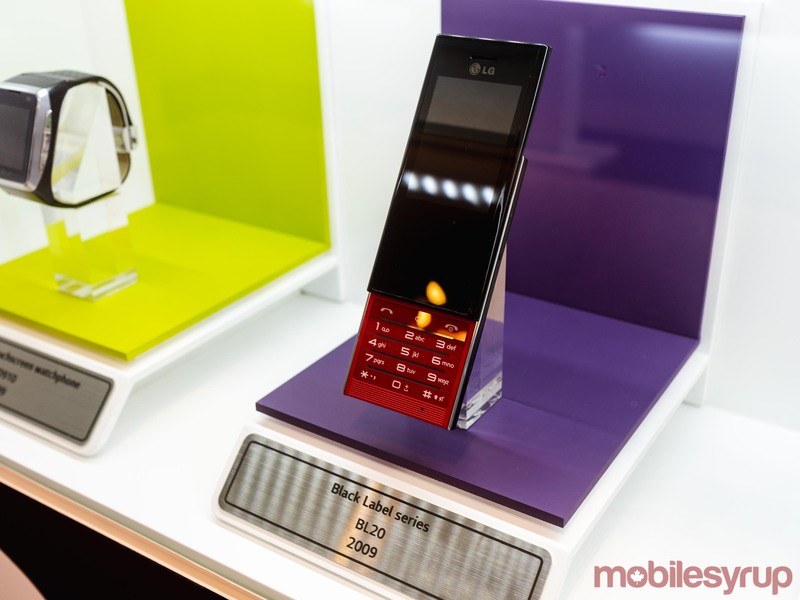 Other highlights include the first CMDA phone manufactured by LG, and a wall dedicated to the company’s mobile phone output. Here, you can see almost every major LG mobile release, including fun throwbacks like the Chocolate. 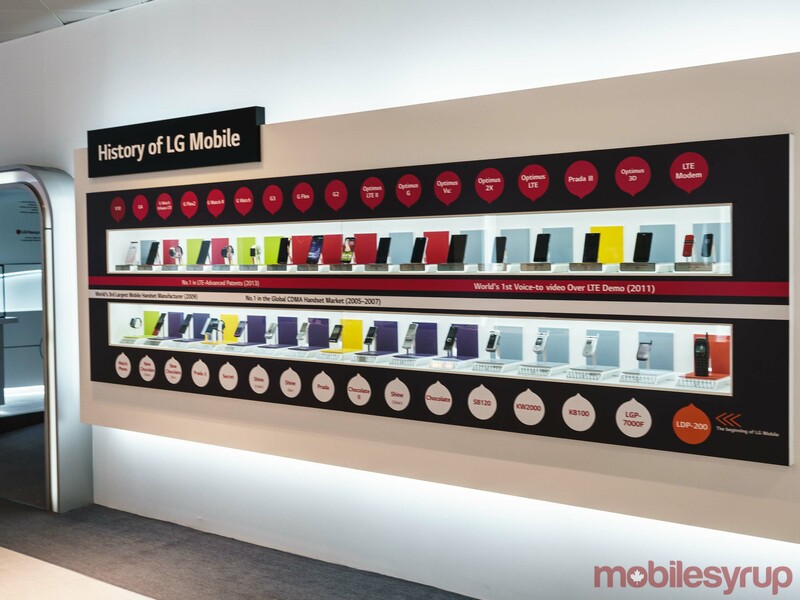 LG Mobile’s history, as told by the phones and wearables the company released. Learning the history of LG helps one appreciate just how much chaebols — the large, family-owned multinationals that dominate the country’s economic output — touch every part of South Korean life. If you known where to look, it’s easy enough to spot all of LG’s various offshoots and subsidiaries. For instance, one of the most popular convenience store chains in Korea is GS25. The GS in the chain’s name stands for GoldStar. It’s a barren street in Korea that doesn’t have at least one GS25 along its stretch. Part of LG Electronics’ Black Label series, the BL20 was released in 2009. With the showroom tour complete, I’m escorted by car to the G2 facility. It’s here that LG manufactures high-end smartphones like the upcoming G7 ThinQ. 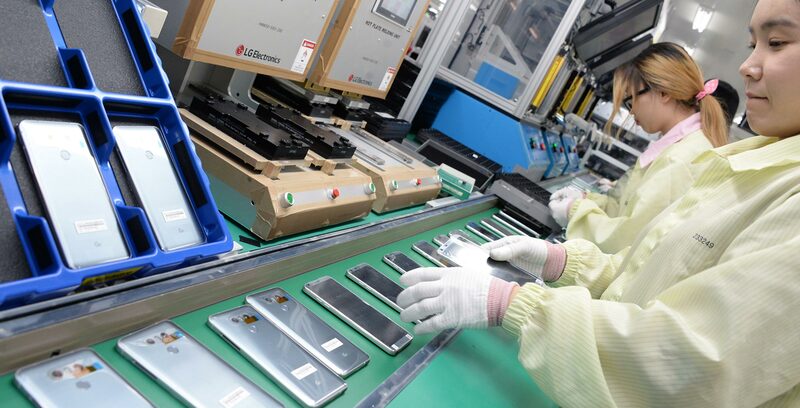 The G2 facility produces thousands of smartphones each day. The facility is divided into three different areas, with each area devoted to a specific aspect of the manufacturing process. For instance, one part of the facility is devoted to materials storage. 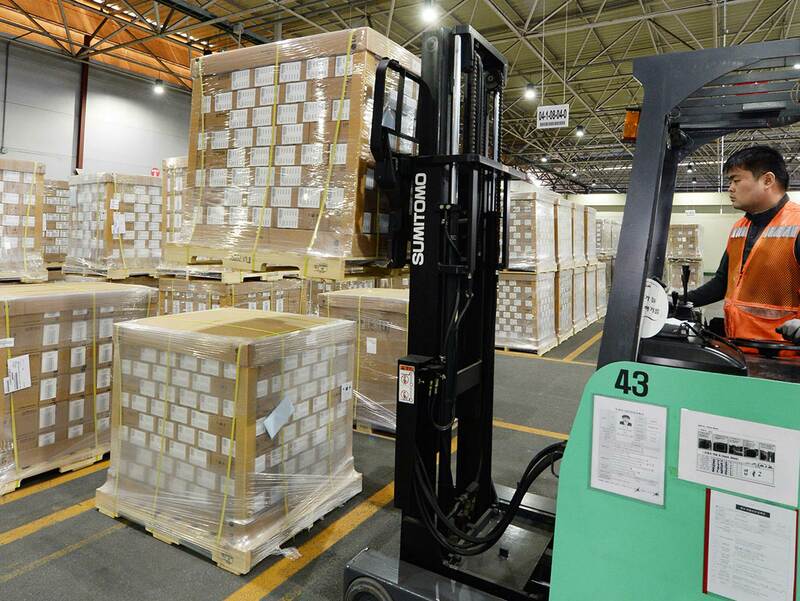 It’s here that LG keeps all the materials its employees need to build its latest smartphones. 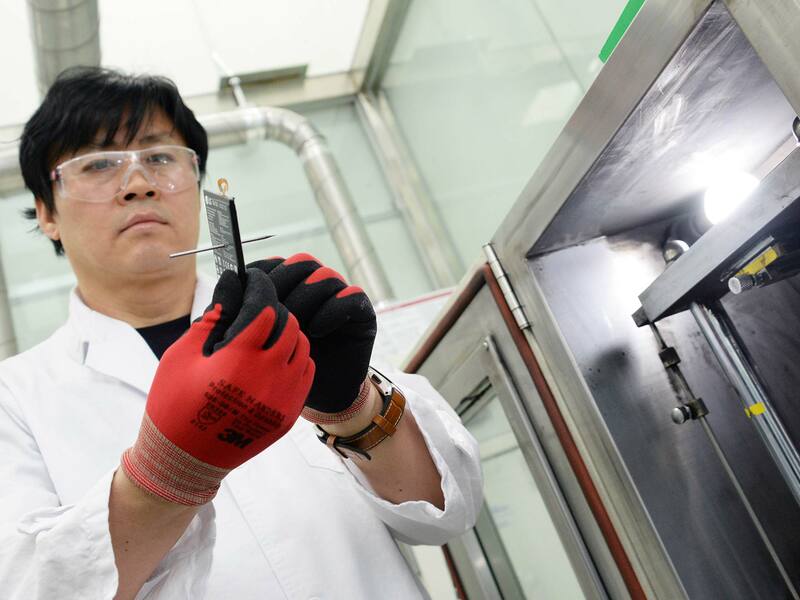 A researcher of LG Electronics holding up the battery of the LG G6 after a ‘penetration test’ which pierced the phone with a sharp nail. Next up is a space devoted to something called SMT. SMT stands for “surface-mount technology.” This is the part of the facility where advanced robotics work to affix components like flash storage onto the printed circuit boards that make up the heart of any smartphone. The last third of the facility is houses the facility’s product assurance laboratory and final manufacturing assembly line. What’s surprising about the assembly line is that it’s far less automated than you imagine. While specialized robotics do assist in manufacturing, the majority of work is done by hand. For example, mounting the screen onto the main body of a smartphone is done by hand. Another surprising revelation is that the majority of the workers on the factory floor are women. A researcher of LG Electronics conducting a drop test of the LG G6. LG says it takes a testing focused approach to manufacturing devices. In practice, this means that at almost every part of the manufacturing process involves some form of testing or quality assurance. It’s also here you see some of the most interesting robotics at work. For instance, there’s one robot that’s entire purpose is to repeatedly test the headphone jack on new phones. Another robot conducts drops tests, while yet another one tests the IP68 water and dust resistance of LG’s newest smartphones. Human workers also take part in testing. LG divides the QA process into two components. The majority of so-called function testing — that is, making sure features like GPS and NFC work properly — is done by precisely calibrated machines. Human workers, meanwhile, do what’s called sensibility testing. They’ll check the user-facing features to ensure that they’re up to spec. At the end of the entire process, once each phone is in its final packaging, a scale weighs each box to ensure that no components are missing. Tune in next week when MobileSyrup will publish an interview I did with Ken Hong, the head of global corporate communications at LG Electronics. Photos of LG Digital Park courtesy of LG.